It was sunny and warm this morning so after breakfast we grabbed wetsuits and surf boards and headed for the beach. After a little surfing (or attempting to surf anyway) we relaxed on the beach for awhile, then somewhat reluctantly packed up to continue our journey south-west along the coast. We stopped for a picnic lunch in East London (seems to us it should be South London) which seems to be a pleasant town. 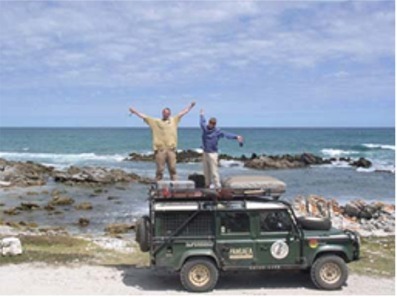 We stopped again in Port Alfred to check our email, then headed to Addo Elephant Park. We arrived too late for a game drive, although we did see some elephant and buffalo from the campsite. We awoke early for a game drive and saw lots of hartebeest, warthog, and kudu, as well as elephant. Interestingly, there were no Impala! After breakfast we left the park and headed for Tsitsikama, passing through Port Elizabeth en route. Unfortunately, our friend Sofia whom we met in Mozambique and who lives in PE is currently in Cape Town, so we’ll miss seeing her. We arrived at the park at about 2pm and enquired about the 5-day otter hiking trail. This is supposed to be the best hike in South Africa, and it must be since it’s booked up a year in advance. So after verifying with Peter our shipping agent that we still have to load on the 30th, we booked an “adventure tour” for tomorrow which will consist of abseiling, black water tubing, and mountain biking. We headed down to the campsite on the coast to find a place to sleep. This has to be one of the most picturesque campgrounds anywhere. 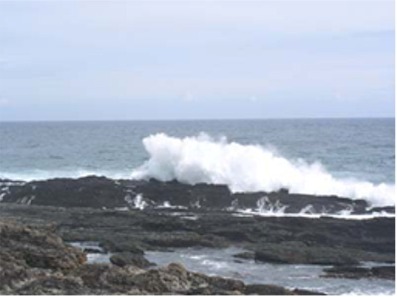 Massive surf breaks onto a rocky coast just meters from the campsite throwing up huge and spectacular spray. It’s the kind of thing you can just sit and watch, mesmerized. We went for a short hike, then cooked dinner and enjoyed the sounds of the surf. We awoke from a great night’s sleep, enjoying the relaxing sounds of the pounding surf. Leaving our table and chairs behind to secure our camp site, we drove to storms river village. 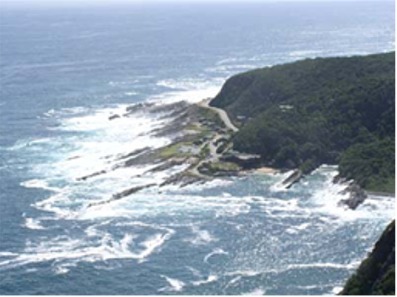 The tour company kitted us up with wetsuits and abseil harnesses, then drove us a short distance to storms river gorge. We clipped in and made a spectacular 110m rappel into the narrow canyon. At the bottom we inflated our tubes and spent the next 2 hours floating and walking 1.6km down the gorge. At the ‘take out’ we climbed back to a dirt road where snacks and mountain bikes had been delivered. Four of us elected to do the longer 22km ride that took us out to a viewing platform overlooking our campground. Back at the office we ate our lunch at about 430pm, then headed back to the camp. Full from our late lunch we skipped dinner and spent the evening watching the waves crashing against the rock. We went for a short hike this morning along the first section of the otter trail, ending up at a waterfall. A brief swim in the cold water at the base of the falls was very refreshing. It’s easy to see why this hike is so popular. On the way back Jen spotted several humpback whales and a few dolphins. After lunch we reluctantly left Tsitsikama and headed for George, where we plan to stay with Wouter. 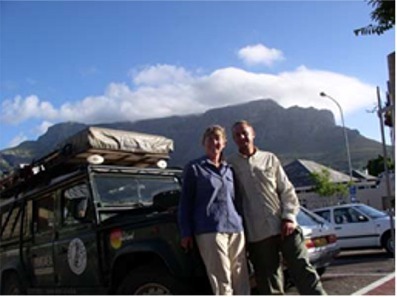 Graham Wilde from Johannesburg introduced us to Wouter, who is also involved in the Tracks4Africa project. He and his wife Esther took us to dinner at a local restaurant where we enjoyed sheep’s neck for our thanksgiving dinner. We spent the evening at their house talking about maps, travel, and Africa. After saying goodbye to Wouter and Esther this morning we followed a route Wouter suggested that took us over a beautiful mountain pass to the town of Outdshoorn where we met Johann, a friend of Wouter’s who is also involved with T4A. He runs a Steer’s restaurant and treated us to breakfast as we told him a little about our trip. We continued east, stopping alongside the road for our standard lunch of tuna, mayo, and sweetcorn sandwiches and Simba peri-peri flavored crisps (potato chips). We stopped at a couple of vineyards and picked up some port and a bottle of brandy. Shortly after a stop for groceries in Swellendam we were stopped at a police roadblock. I was a little concerned because my international drivers license expires today. They pulled over every car on the road, stopped us, handed everyone little paper cups full of coke, and waved us on, whishing us a good journey. Very strange. We drove through some beautiful farmland on the way to De Hoop nature reserve. 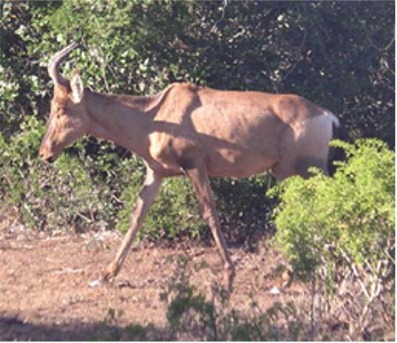 In the park we saw bontebok and eland, two antelope we haven’t seen before. We went to the beach to watch for whales for a little while. Over dinner we lamented the fact that this might be our last night of camping on the trip. We went for a hike along the coastal trail this morning and spotted a few of the endangered oyster catcher birds, as well as whales and dolphins. Leaving the park we headed through more farmland to Cape Agulas, which marks the southernmost point of the continent of Africa. In a strange geographical coincidence, this point lies at precisely 20 degrees East Longitude. After some celebratory photos we headed for Hermanus and Lynn and Dudley’s house (the couple whom we helped when their car broke down near Mkuzi game reserve a few weeks ago). They live in a beautiful home in the seaside resort town of Hermanus, about a block from the sea. They put us up in their guest cottage. The springboks were playing Scotland (rugby) and Dudley tried to explain the game to us as South Africa trounced scotland. We went for a walk through town while they made us dinner and we sat up talking until almost midnight. 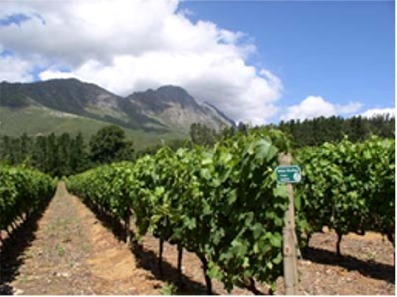 They bought a grape farm in the Stellenbosch region in the 1970s and recently turned it over to their two children who have recently started making wine. They promised to set up an appointment to tour the vineyards in a couple of days. 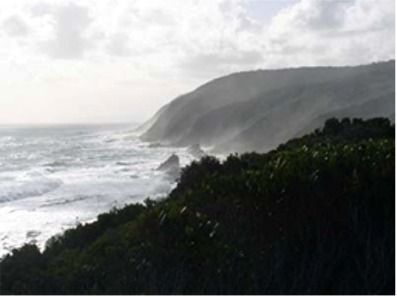 After breakfast with Lynn and Dudley, we took the coastal route to Strand where we headed inland to the wine region. Most of the vineyards had closed by the time we reached Franshoek, so after a quick look around the very French town we located a campground on the way to Stellenbosch. After having enjoyed a nice lunch at a restaurant along the coast we decided to have some leftover pasta for dinner. We have to be in Cape Town tomorrow so this will likely be our last night in our tent. We enjoyed the sound of the nearby river as we drifted off to sleep. We stopped first at the Simonsvlei vineyard this morning. Perhaps it was because we had just finished breakfast, but none of their wines tasted good to us. Next we went to Praal to visit the large Nederburg estate. The wines here were better and not too expensive, and we bought a few bottles. 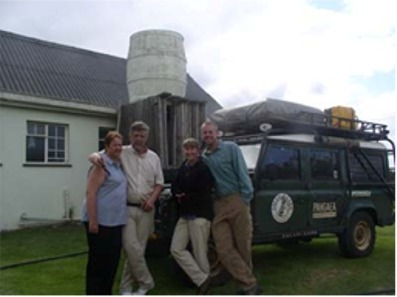 Next we drove to Stellenbosch and stopped at the Marklew farm, run by Haide and Billy, the daughter and son of Lynn and Dudley. They were very hospitable and spent over an hour with us explaining their handcrafted wines. We took advantage of their generous offer of wholesale pricing and bought 3 cases of wine. Haide even phoned to Cape Town for us to book a room at a backpackers. On her recommendation we stopped for an excellent lunch at another winery and bought a couple more cases. Our wine tasting time exhausted, we got on the road for the last leg of our trip to Cape Town. After the usual big city navigation and traffic hassles, we managed to locate the backpackers in the city center. We were tired from a hard day tasting wines, but we have to be at the dock to send rafiki off tomorrow morning at 10am, so we spent the evening changing ourselves from overlanders to backpackers. We cleaned out the fridge and packed it with wine, and pulled out our clothes and backpacks. After a quick dinner we went to bed.